Please note: This item is expected to ship on May 22, 2019. 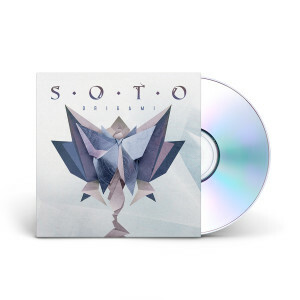 SOTO, the group lead by acclaimed vocalist and current Sons Of Apollo frontman Jeff Scott Soto (ex Yngwie Malmsteen / Talisman / Journey, Trans-Siberian Orchestra, W.E.T. ), returns with their third album and InsideOutMusic debut Origami, which showcases 10 tunes of modern, melodic and highly-versatile hard rock and metal with addictive songwriting and an infectious level of catchiness. The album comes packaged in classy artwork by Gustavo Sazes (Machine Head, Amaranthe, Arch Enemy).